This spacious recreational home features a standard fireplace as a central element of its attractive architecture. It has three bedrooms with one in the loft, two on the main floor and 2½ bathrooms. The dining room, great room and master bedroom all have beautiful large windows with a lake view. It has a 12/12 pitch and though the standard plan does not assume a walk-out, it works very well with one. Whether this is your cottage or year-round home, it’s perfect to get away to or for entertaining family or friends. This modular home is an affordable 3 bedroom starter home with a 14x11 living room, main floor bathroom, dinette and large kitchen area. With two alternate floor plans to choose from, The Almonte is a popular choice for many first time home owners. This three-bedroom home is ideal for entertaining with the kitchen, living and dining rooms at the front of the home leaving the quiet sleeping areas towards the back. This home has an amazing amount of storage space. Large walk-in closet in the master and second bedrooms, walk-in laundry and a convenient walk-in closet at the garage entrance, are all handy for busy families. A variety of options are available, including a single or double garage, decks and a gas or wood-burning fireplace. This one-and-a-half storey home features one bedroom on the ground floor and space for two more upstairs when you’re ready to expand. The main floor laundry/mud room, full 4-piece bathroom and loads of closet space make this an easy-to-live-in home. Add the optional windows and decks to the front elevation and you’ll have the perfect lake-side retreat. A traditional “Cape” style home featuring 1,110 square feet of fully finished space on the main floor, with the potential to add another 780 square feet of finished space upstairs either during the site finishing, or at a later date. The matching dormers and full width front porch roof give this home an appearance of casual elegance, while inside you’ll enjoy the spacious master bedroom and living room and the open plan kitchen and dining room. Coat closets at both entrances, and a ground floor laundry round out the convenience features of this charming home. Traditionalists will appreciate the classic elegance of this colonial style home. The spacious, center hall plan allows either a great room or a separate living room and family room configuration. Upstairs you’ll enjoy four spacious bedrooms, including a master with a walk-in closet and a full ensuite bathroom. You’ll also appreciate the convenience of the main floor laundry and powder room, as well as the well-appointed kitchen with its large, informal eating area. Choose from our wide range of available options, including a wood or gas fireplace and a garage to complete this wonderful family home. This spacious three-bedroom home puts the emphasis on family life with its central, open-concept kitchen and dining area that opens onto the adjacent family room. Choose the larger floor plan and enjoy the convenience of the main floor laundry/mud room. The master bedroom boasts a full ensuite and you also have your choice of a wide range of options including bay windows, a wood or gas fireplace and a single or double garage. These two larger versions of this popular home feature a large, open kitchen and family room area, a private bedroom wing and spacious living and dining rooms. Both plans include a main floor laundry, two full bathrooms and the stunning architecture which has made the Carleton one of our most popular models. Choose from our wide range of available options, including a wood or gas fireplace and a single or double garage, to personalize this distinctive home. The New England countryside inspired this traditional two storey home. Twin dormers highlight the 12/12 roof pitch on the front elevation, while inside you’ll appreciate the spacious, well thought out floor plan. On the main floor, enjoy the expansive great room and the well-appointed kitchen, together with the separate dining room which could also be used as a home office or study. Upstairs, three generous bedrooms, including a master suite featuring a walk-in closet and a 4-piece ensuite, await you. A separate side entry and main floor laundry are the final touches which make this the ideal family home. This spacious three-bedroom ranch style home features a private master suite, well separated from the other bedrooms, and a stunning, open-plan great room and living room combination. The well-appointed kitchen features a convenient central work island and you’ll appreciate the main floor laundry/mud room just off the side entry. For a truly spectacular look, add the optional vaulted ceiling, window wall and gas fireplace to the great room – you’ll never get tired of the view! This spacious three-bedroom ranch style home features a private master suite, well separated from the other bedrooms, and a stunning, open-plan great room and dining room combination. The well-appointed kitchen features a convenient central work island and you’ll appreciate the main floor laundry/mud room just off the side entry. For a truly spectacular look add the optional vaulted ceiling and window wall to the great room – you’ll never get tired of the view! This beautifully designed home is illuminated with plenty of natural light starting with the large living room window combined with the patio door and dining room Windows. The inviting kitchen island will certainly be the main focal point of any party or family event letting guests sit back and relax. You can choose from many upgrades or options like a stunning fireplace to add to this home’s charm. The country feel of this home with its wrap-around front porch, is complemented by its spacious living room and formal dining room. The well-appointed kitchen features a built-in breakfast counter and opens onto a bright dinette and a cozy family room which could include a gas or wood burning fireplace. A main floor powder room and a separate laundry/mud room with access to the garage make this a practical and convenient home for today’s active family. A master bedroom with a 4-piece ensuite and a double garage complete this appealing three or four-bedroom home. A large eat-at island is one of the many special features of this home. The layout is ideal for those who enjoy the friendliness of an open kitchen and dining room when spending time with family and friends. The large eyebrow on the Dutch gable at the front of the house enhances this already attractive elevation. Your bedrooms will be quiet and private being situated away from the living and dining areas. You can choose between two bathrooms or one with dual entrances off the hallway and master bedroom. Each version combines nicely with either of the breezeway options. This is a classic design and, year after year, one of our most popular two storey models. Traditional 19th century lines combine with an expansive wrap-around porch to suggest more than a touch of elegance. The spacious four-bedroom interior features a well-planned kitchen, a sunny breakfast room, a convenient main floor laundry and 2½ baths. A detached double garage is also available. This is truly an outstanding family home. This two-bedroom home featuring a huge kitchen/dining room combination is perfect for empty-nesters or for those just starting a family. The foyer offers a place from which you can welcome your guests into the generous living room with its beautifully designed windows. The master bedroom has a walk-in closet and ensuite bathroom affording you space, comfort and privacy. Round this out with a ground-floor laundry room and an eat-at island and you have the perfect home at the perfect size, whether you’re planning to live in town or out in the country. This spacious estate home features four bedrooms and three bathrooms behind its elegant exterior. Interesting roof lines, generous windows and a large front porch combine to give this home an appealing front elevation. Inside you’ll find well proportioned spaces, including a fabulous great room and a ground floor master bedroom with a luxurious ensuite. A large fourth bedroom on the second floor, featuring a 3-piece bathroom and its own private sitting room, presents all sorts of opportunities – a guest suite, children’s area or even an alternative master suite – the choice is yours! A large, double garage, ground floor laundry/mud room and well-appointed kitchen round out the many features of this beautiful home. The vibrant heart of this fully featured, compact home is the open living space that joins the living and dining rooms with the kitchen and optional family room. Three good size bedrooms and two full bathrooms, including an ensuite, form an adjacent gabled wing, well isolated from the living area. Large windows and a standard patio door keep the interior bright, while outside, an optional covered porch and garage round out the surprising range of features available with this beautifully designed, affordable home. This beautifully designed, open-concept home is perfect for entertaining, or for just relaxing after a hard day of work. The stunning craftsmanship of the roof lines adds to the beauty of the front elevation. The spacious living room with its cathedral ceiling opens into a gourmet kitchen featuring a large island with a bar top counter. The master bedroom with a full bathroom is also on the main level, eliminating the need to climb stairs at the end of the day. Upstairs you’ll find two bedrooms and a full bathroom plus a charming space to curl up and read a book or use as a secluded hide-away for your office. The choice is yours. You can also enjoy the outdoors from the optional screened-in porch. Designed for a smaller, urban lot, this well proportioned home features three bedrooms, two bathrooms and a ground floor powder room. The sophisticated front elevation combines appealing roof lines with a deep porch at the front entrance. The master bedroom features a walk-in closet and an ensuite with ‘his and hers’ basins or, choose the optional ensuite with a whirlpool tub and separate shower. You’ll also enjoy the convenience of having your washer and dryer located upstairs, where most of your laundry comes from! On the ground floor, the kitchen, dining area and living room are open plan and filled with light, while the home office offers more private space and a convenient location off the foyer. The Meadowgate offers a variety of floor plan combinations that allow you to choose from one, two or three bedroom layouts while maintaining pleasantly separated sleeping and living areas. A centrally located second, full bathroom and main floor laundry room are key highlights of this home. These features, combined with a covered porch entrance and large foyer make this one of our most versatile models. Top it all off with a large master bedroom with ensuite and walk-in closet and you’re all set for years of comfort and luxury. This charming three-bedroom home has a perfect layout for entertaining. Its open-concept kitchen/dining room connects to the living room, allowing you to have activities centered around your sizeable kitchen island. All three bedrooms feature large closet space. The bathroom is fitted with a tub and convenient separate shower. The bump outs added to the front entrance and the dining room will give you that extra space we all need, and it also gives the exterior further curb appeal. Options such as a one or two car garage and back deck would be wonderful additions to your new home. This two-bedroom home will appeal to those just starting out on their own as well as empty-nesters. The open-plan kitchen looks out onto the large living room with its optional fireplace. The larger version of this model also features an eat-in kitchen with a convenient island, perfect for those kitchen parties we all enjoy! The home also features a mud room/laundry room combination ideal for country living. Combine these details with your final touches and make this your dream starter, or retirement home. Spend your evenings relaxing in the warm summer breeze while enjoying the view outdoors on your spacious wrap-around porch. This home has unique interior style with its angles starting in the front entrance and flowing into the bedrooms. Both the master and the second bedroom have plenty of room to move around, and both have ample closet space. You can always add an optional gas or wood-burning fireplace to make this home even more inviting. This split-level home features modern styling and architecture with its hip roof design making it a perfect fit for a rural lot or village environment. Large 4’ wide stairs lead up or down from the foyer which features an arched transom window and sidelights that will brighten your home and make your guests feel welcome from the moment they arrive. At the top of the stairs, the spacious, open-concept floor plan provides a breathtaking view of the principal rooms. Whether you choose the 1,353 sq. ft. model with the separate living and dining rooms, or the larger plan with the bright sunroom off the kitchen, either version of this beautiful home is perfect for family life and entertaining. This traditional, ranch style home features an impressive six foot porch extending across the entire front of the house. There are two standard floor plans – one geared for the younger family featuring three bedrooms and one bathroom and the other designed for the ‘empty nester’ featuring a master bedroom with a walk-in closet and a fabulous ensuite, together with a second bedroom and bathroom. Both plans have a convenient rear entry to a combined laundry/mud room, a well-appointed country kitchen with a spacious eating area and a large great room. Whether you’re moving up from your first home or down from a large family home after the children have gone, the Ridgestone has all the features you’re looking for. From an elegant front elevation and loads of windows, through three generous bedrooms, an open-concept floor plan and a beautiful central kitchen which opens onto a large family room and a separate dinette, this home has it all! Add to these an ensuite with separate tub and shower and a mud room with an entrance off the double garage and a convenient laundry area and you’ll see why we believe this is one of the most value packed homes on the market today. Step through the large, bright entrance of this elegant, raised ranch. You’ll find almost 1,500 square feet of well-appointed space including a large eat-in kitchen, a spacious, 4-piece ensuite bath and a huge living room. Choose from a wide range of available options including walk-out bay windows, gas or wood burning fireplaces, skylights and a single or double garage to truly make this house your home. This distinctive home features a fabulous country kitchen with an eating area surrounded by glass, a pantry, a convenient central work island and a patio door leading to an optional wrap-around deck. Enjoy the convenience of a main floor laundry or the luxury of an oversize tub and separate shower. Three bedrooms, generous closets and an expansive living room complete the interior, while outside, the off-set roof and front gable will make your new home stand out from the crowd. Let us build one for you! This charming country home features a distinctive front elevation that sets off the large, wrap-around porch – perfect for those warm summer evenings. Inside you’ll appreciate three bedrooms and a spacious country kitchen. With the larger plan you’ll also enjoy a full ensuite bathroom and a convenient central island in the kitchen. A wide range of options including a front gable, a bay window and a wood or gas fireplace are also available, whichever plan you choose. This sprawling ranch style home caters to formal, classic tastes. The high-pitched roof perfectly complements the balanced proportions of the front elevation. Inside, you’ll appreciate the well-appointed kitchen, main floor laundry room and generous master bedroom featuring his and hers closets and a full 4-piece ensuite. Choose either the separate living and dining rooms or open up the space to create a great room – either way this elegant home is the perfect setting to entertain your friends in style! Welcoming and friendly best describe the road side foyer of this beautifully designed country retreat. The spacious entrance draws you in through the great room, directly into the kitchen, to the secluded bedrooms or down the staircase to a lower level that is perfect for a property which allows a walk-out. Your view will be uninterrupted through the classic look of the four large sloped windows and the master bedroom will be your private oasis with a large walk-in closet, ensuite bath and sitting area. Add the optional screened-in porch of this home will allow you to believe dreams really do come true. Double front gables, overhang returns on the front eaves and a covered veranda blend together to give this model its welcoming appeal. Inside, this thoughtfully designed home begins with an island closet in the front hall and continues through to a spacious living room with a beveled/coffered ceiling. 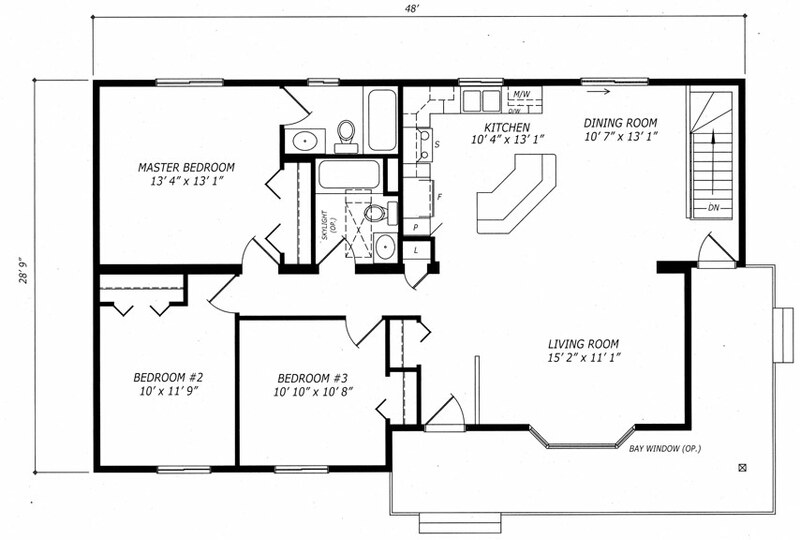 All floor plans include a generous kitchen with an eat-at island and mud room or laundry room off the garage. Each “quadrant” is fully interchangeable with those of the other two plans allowing you to easily modify this home to suit your personal taste and needs. A Victorian take on a traditional ‘Cape’ style home, this model features 999 square feet of fully finished space on the main floor with the potential to add another 623 square feet of finished space upstairs either during the site finishing, or at a later date. The covered porch at the front entry, bay window and steeply pitched roof all combine to give this charming home an appealing front elevation. The compact design uses an open-plan kitchen, eating area and family room to visually expand the space, while still providing a more private area at the front of the home. Once the upstairs is finished, you’ll enjoy a full three-bedroom, two-bathroom family home. Classic styling and attention to detail combine to create a home of lasting impression. Sized for today’s family, you may choose the 1,266 sq. 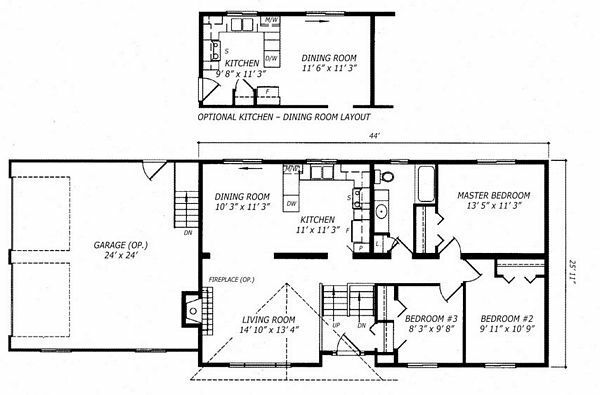 ft. model which features an eat-in kitchen or the larger 1,410 sq. ft. model with its central work island in the kitchen and a breakfast room, which can also be used as a family room. Either way, your three-bedroom home will feature a large wrap-around porch, main floor powder room and a 3-piece ensuite. The Victoria is available with either a single or double garage and a wide range of other optional features. The expansive great room is just right for entertaining your guests and still be part of family activities while preparing meals. This design offers unique workshop space in the garage with easy access to the basement, bathroom, and the laundry/mud room for those messy projects. The master bedroom has a generous ensuite bathroom and large walk-in-closet with an option for a 4-piece layout, the choice is yours. The optional sunroom provides even more space for relaxation with enough windows to give you that great outdoor feeling.